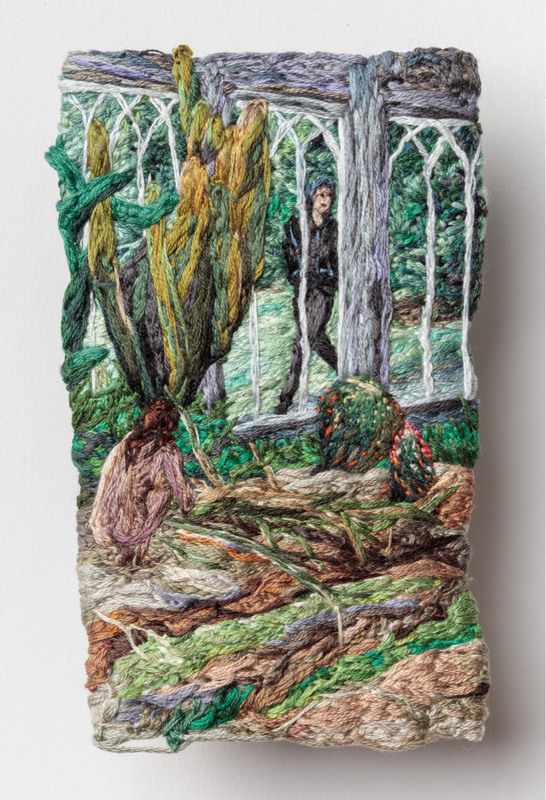 Sophia Narrett, Hide and Seek, 2016, Embroidery, thread, and fabric, 4.75" x 3.1"
OOF Books is pleased to present Metamorphosis, Lightly (Intimacy of Form): an exhibition curated by Alex Rojas featuring the work of Nasim Hantehzadeh, Carolyn Janssen, Larissa Lockshin, Erica Mahinay, Sophia Narrett, and Sarah Ann Weber. Through intimacy in medium and content these artists create humorous and quiet moments of provocation to question the relationship between the self and materiality. In their search, they stumble upon the mounting absurdity of the contemporary human condition and the unique comfortability—a persistent, almost predictable, inconsistency—that this can provide. With execution largely varying, the concept of subjectivity and individual boundaries of self is introduced, examined, and reexamined. In Janssen’s “I” That I Know: a reality of absurdity is created through digitally collaged photographs. Janssen uses herself as a comical subject of transformation, transmuting between male and female. In addition, she challenges the rules of femininity and the duplicity of identity. Erica Mahinay explores the tension of surfaces, ultimately negating the construct of human form: poking fun at it with decaying fruit. Using velvet, gold leaf, and satin, Lockshin creates sensuous works addressing surface: the gold leaf natural membrane against the surface of velvet. Her mediums resist limitations—avoiding the categorization of painting and sculpture. The paintings exist as a form and an object. Weber’s small patterned watercolors are appropriated from the borders of sixteenth and seventeenth century tapestries. Stripping the essential narrative tapestry images, Weber does a close study of the foliage and form. Sophia Narrett's Crying, inherently evokes the body and form through the sensuous portrayal of what remains after the act of crying. Nasim Hantehzadeh’s work explores transmuting forms of gender and identity as a cathartic experience: addressing her background as a Muslim American female. Together these works highlight the perennial and intimate connection with chaos inherent in human existence. Speaking to a desire for reason, these works provide intimate outlets for exploration and clarity through identity and physicality.